The abacus is an ancient calculating tool that dates back centuries. Early societies used some Abacusform of it to count and do arithmetic long before they invented numbers. Mostly, they calculated problems by moving stones or beans around in grooves or on tablets. You can still see the abacus being used in parts of Asia and Africa by merchants and traders who work with the swiftness of lightening. Your child will become just as skillful. 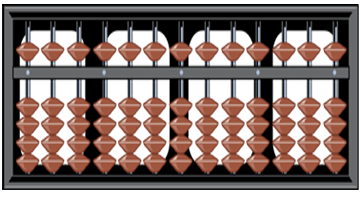 At Math Genie we use the abacus because it is an invaluable tool to help children understand mathematics. Little children have difficulty grasping arithmetic because it is not something they can see or touch. By working with beads on the abacus, math becomes something your child can understand.